The New York Knicks have made a habit out of failing to land a big fish in free agency. In fact they’re really, really, really good at it. For as much as the Knicks always seem to be in the conversation of landing a superstar because of the mystique of Madison Square Garden or playing in the biggest media market in the world… somehow it never seems to pan out. It all seems to be a myth. Now after the shocking trade of Kristaps Porzingis to the Dallas Mavericks, we’re supposed to suddenly believe that this is the key move that unlocks the potential for the Knicks to become the greatest superteam of all-time. We’re supposed to believe that the Knicks getting rid of their best player and dumping him for cap space is a stroke of genius that will lead them to greater heights. Now that the Knicks will have the cap space to sign two max free agents this summer, surely they will sign Kevin Durant and Kyrie Irving. Maybe it will be Kawhi Leonard if one of those first two don’t work out. Then they’ll get a frozen ping pong ball to bounce their way to draft Zion Williamson. Then finally the Knicks will get the dynasty that they have long been assuring their fans was just about ready to explode. If you truly believe all that is going to happen, then there’s a bridge worth selling you. Because it’s never worked out like that for the Knicks. Remember when the Knicks were in the conversation to land LeBron James in 2010? That didn’t happen. How about when LeBron became a free agent again in 2014? Nope. What about this past year when he whispered to Dwyane Wade about “the garden” and sent the Big Apple into a frenzy. Surely this would be when LeBron would sit in the empty throne for the King of New York. Alas, it was once again not to be. If NBA titles were dished out based on superstars giving consideration to joining franchises and then never doing so, the Knicks would be running out of space in the trophy cabinet. Before he opted to join the Golden State Warriors, we had to hear about how Kevin Durant was considering the Knicks based on the strong recruitment of Carmelo Anthony. What could have been. Instead of landing the James and Durants of the world, the Knicks have had to settle for splashing out the cash on mediocre to terrible contracts and trying to squeeze any last semblance of good play out of aging former all-stars. The list of free agent signings the Knicks have had the last decade is downright depressing. Tim Hardaway Jr was signed in 2017 for four years, $71 million. In 2016 the Knicks signed Joakim Noah (four years, $72 million) and Courtney Lee (four years, $50 million) to multi-year deals. That’s the summer when Derrick Rose infamously dubbed the Knicks a superteam. The year before was when New York gave Robin Lopez a $54 million contract over four years. Of those players, only Lee actually made it more than two years with the team before being dealt away. They combined for zero playoff appearances. Going back further than that and the Knicks’ free agency history this decade is littered with former superstars making ceremony stops at the end of their careers like Jason Kidd, Rasheed Wallace, Baron Davis, Lamar Odom, and Metta World Peace. The last Knicks free agent signing to actually make an impact? Jeremy Lin. The last $100 million contract the Knicks gave out in free agency? Amar’e Stoudemire. Go back even further and we get into Eddy Curry and Jerome James territory. And yet, the myth of being able to land a superstar free agent is exactly what the Knicks are selling their fans once again after trading Porzingis away for cap space, a hope, and a prayer. The trade looks like one of the most lopsided in recent NBA history. The Knicks are dealing Porzingis, Trey Burke, Hardaway, and Courtney Lee to the Dallas Mavericks for Dennis Smith Jr., the expiring contracts of DeAndre Jordan and Wesley Matthews, and two first round picks. Dallas now has a young dynamic duo that they can build around for years to come in Porzingis and Luka Doncic. The Knicks on the other hand have… cap space, a hope, and a prayer. 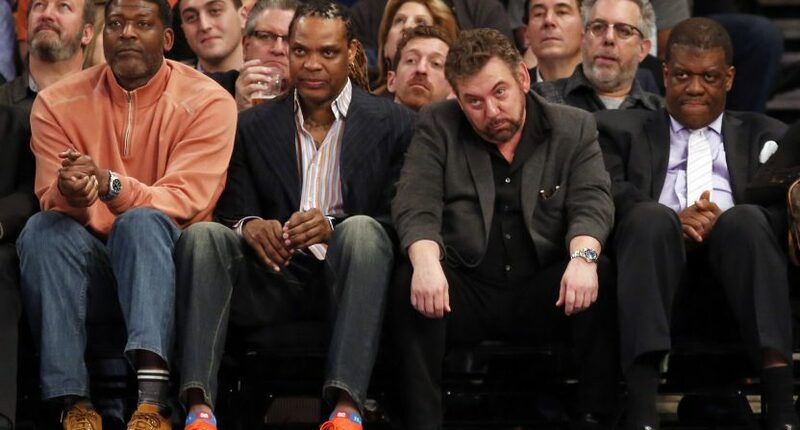 ok so what's the worst case scenario here for the Knicks? they dont get Durant or Kyrie and essentially traded Porzingis for Dennis Smith Jr., 2 first round picks, and instant, complete salary cap cleansing? . im feeling better now! Are we really to believe Kyrie Irving would leave a nucleus of young stars and veterans with the Boston Celtics for the uncertainty of whatever the Knicks’ future is? Are we really to believe that Kevin Durant is so annoyed with Draymond Green that he’s willing to trade in a team that’s won multiple titles for the visionary leadership of James Dolan? How tough is it going to be to sell these players who have built their careers around winning on a complete and total rebuild from out of nothing? Sure, perhaps this is the summer where it finally happens for the Knicks, but there’s no evidence this century that the Knicks can actually follow through and recruit top level free agents to the Garden. Why do I say stars don't wanna go to or stay in NY? – Since '88, Stoudemire is the ONLY player to go to the Knicks the season after an All-Star appearance. – Also in last 30 yrs, Charlie Ward & David Lee are the only Knicks 1st rounders to stay w/ the team for at least 5 years. What happens if Irving and Durant stay put? What happens if Anthony Davis links up with LeBron James in Los Angeles? What happens if the Knicks don’t win the draft lottery (even with the worst record, they would only have a 14% chance at the No. 1 pick)? Then they will have gutted their roster for absolutely nothing and will wind up in the same place they’ve been for the last fifteen years. I hear Carmelo Anthony is available, though.